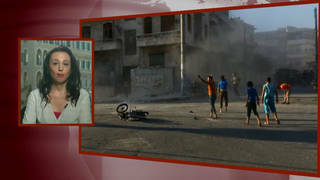 Shows featuring Rania Abouzeid | Democracy Now! Award-winning journalist and author. She’s the author of No Turning Back: Life, Loss, and Hope in Wartime Syria. She has reported extensively from Syria since the uprising began in 2011, and has received the George Polk Award in 2014 and the Michael Kelly Award in 2015 for her coverage.